Yesterday evening we finished watching Guardians of the Galaxy. I knew absolutely nothing about the Guardians of the Galaxy comics going into the movie, and despite all the hype I hadn’t been very interested in seeing the film. I usually love the Marvel movies, but for whatever reason Guardians never caught my attention. I think part of it was that the film seemed a little cartoony and too caught up in trying to be funny. Most of the Marvel films have a pretty decent and often self aware sense of humor, however the trailer made it seem like Guardians was going to take it a little too far. Overall the movie was enjoyable, and it definitely has nice scenery and special effects that stand out on Blu Ray, however I couldn’t really get on board with the humor. Sure it was funny for the first few jokes, but after awhile it just felt like it was trying too hard. That said, I think Vanessa enjoyed it more than I did so maybe I just wasn’t approaching the film with the right attitude. Guardians is certainly of a different tone than most of the Marvel movies, but maybe that isn’t such a bad thing. It isn’t quite as predictable as other comic book films, and the characters are unique and fresh. Bautista plays his role especially well, and I was surprised by the quality of his character. Groot confuses me, but I feel like he provided the best comedic relief in the film. Rocket Raccoon started out as an enjoyable character, however I feel like his jokes came off a little forced toward the end of the film. 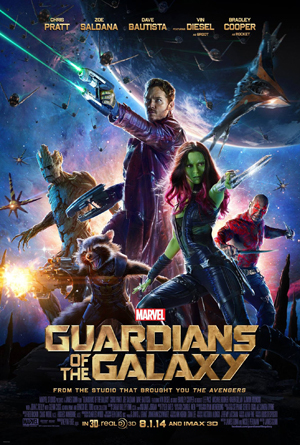 Ultimately I enjoyed the experience of Guardians of the Galaxy, especially the colorful visuals and special effects. I’m interested to see how the story further unfolds, as we’re assured in the end, that the Guardians will return. This entry was posted in Movies and tagged blu ray, comedy, forced comedy, Guardians of the Galaxy. Bookmark the permalink.